Toronto and East York Community Council and more recently the full City Council voted in favour of laneway suites. Over the past two years, advocates for laneway housing in Toronto, including Lanescape and Evergreen, have been pushing for Toronto to re-examine its Official Plan and Zoning By-Law to allow the construction of laneway suites. In response, City of Toronto planning staff prepared “Changing Lanes: Toronto’s Laneway Housing Strategy”, which proposes amendments to Toronto’s Official Plan and Zoning By-law to permit the construction of this emergent form of housing. This change in the regulatory framework is rooted primarily in the desire to diversify Toronto’s housing stock and increase its pool of rental units through gentle intensification. Laneway suites are detached auxiliary dwelling units that replace a laneway-facing garage or parking pad. While Toronto’s Official Plan and Zoning By-Law already allows the creation of secondary suites such as basement suites, it currently does not permit the construction of laneway suites as-of-right. This means that in order to construct a laneway suite, a property owner must seek a Zoning By-Law Amendment (ZBLA) which can be prohibitive due to the large expense associated with seeking these changes (submitting a ZBLA currently costs $41,664.74). This stands in contrast to Vancouver, where laneway suites are allowed as-of-right if a property meets certain parameters. While the permitting of laneway suites is primarily intended to provide an additional form of housing to Torontonians, it also enables the reinterpretation of our established urban form and public realm. Laneways have long been designed to meet the needs of vehicles accessing the rear of a property. To make laneways a fitting place for people to live, play and socialize, rather than simply park their cars, we must transform them into spaces that are more accessible and inviting for people. The Changing Lanes guidelines provide a jumping off point for the improvement of laneways as part of the public realm in our neighbourhoods. As laneway suites replace some rear-lot parking spaces, we have an opportunity to reimagine laneways as valuable public realm assets where people can walk, bike, linger and socialize - helping to build and strengthen vibrant communities. Examples from across the world can provide a rich source of inspiration as we reimagine our laneways in this way. Cities from Seattle and Montreal to Melbourne and Vancouver have transformed their laneways into complete spaces for congregation, celebration, play, greening and connection within and between communities. An important ingredient in the creation of safe, beautiful public spaces is the provision of well-designed lighting. One of the legacies of Toronto’s tradition of designing laneways exclusively for vehicles is the perception that laneways are dark and dangerous places for pedestrians at night. This is because lighting designed for vehicles typically use fixtures that are mounted high up and spaced widely apart, resulting in poor visibility for anyone seeking to move through the space on foot or on a bike. Acknowledging who is using a space plays a key role in determining how it should be lit so as to reassure and invite people in. Laneway suite design guidelines call for the addition of downward-facing lighting fixtures to the laneway façade of laneway suites, to illuminate the laneway and provide a sense of safety while minimizing the amount of light trespass onto neighbouring properties (and into neighbouring bedroom windows). 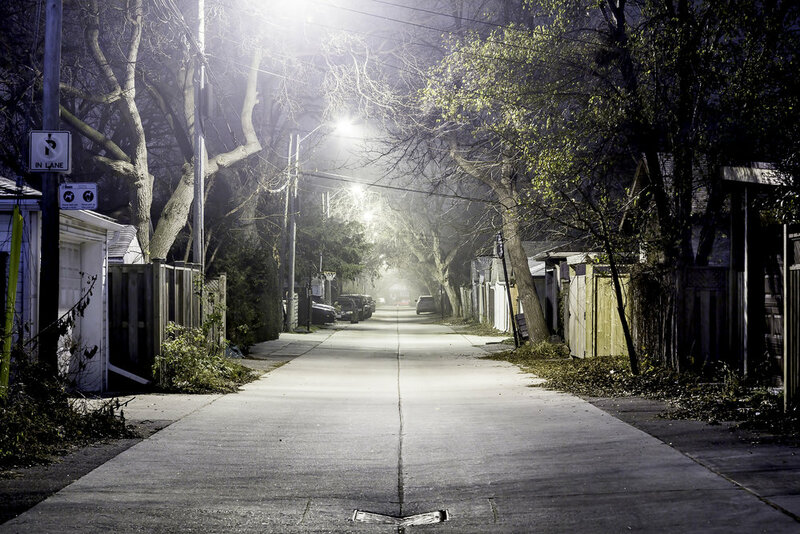 The Laneway Project is currently working on a “Light Up the Laneways” pilot project which seeks to implement pedestrian-oriented lighting in two laneways in the Ossington and Bloordale neighbourhoods, in order to test different methods of illuminating laneways in our city. Additionally, the laneway design guidelines also specify that the 1.5 metre setback from the laneway to the laneway suite must utilize 75% soft landscaping such as planters and small gardens. Requiring this soft landscaping provides the opportunity to explore personalized ways of adding greenery and vegetation to the laneway. Aesthetically this helps reduce the abundance of concrete and asphalt in laneways while providing a valuable ecological function by allowing plants to flourish, and water to enter soil rather than storm drains. The Changing Lanes amendments as adopted, paired with other recent laneway-friendly policy moves and guidelines in the Official Plan amendment, Complete Streets Guidelines and TOcore Mobility and Parks & Public Realm Strategies, provide a good foundation for the on-going improvement of Toronto’s laneways as vibrant, appealing public spaces where pedestrians, cyclists, and residents can linger and connect.